There were a bunch of cool bicycles and tricycles cruising around the Mission, the neighborhood selected for June 2009's Sunday Streets. San Francisco Mayor Gavin Newsom has announced the Sunday Streets events will become a permanent program in the city. The program was created to give residents an opportunity to be outside and use city streets, which are closed to cars during the events, to enjoy other methods of transportation such as walking or bicycling. The sixth and final Sunday Streets event this year took place Sunday along the Great Highway near Ocean Beach. Featured on Sunday was a human tire pull competition, exhibits from the California Academy of Sciences and San Francisco Zoo, and a bike rental facility, among other activities. 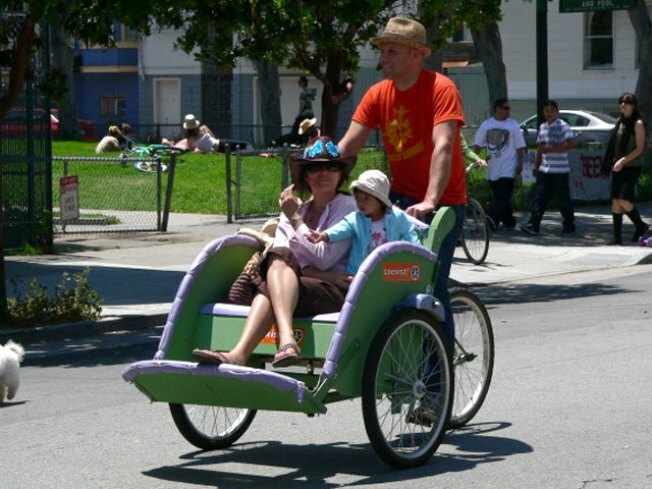 Sunday Streets began in 2008 with two events, and was increased to six events this year. The other Sunday Streets events this year took place April 26 along the Embarcadero; May 10 from AT&T Park to the Bayview District along the Bay Trail; June 7 and July 19 in the Mission District; and Aug. 9 through Golden Gate Park and along the Great Highway.